Veteran Rangers defender David Weir is to leave Ibrox this week with England the likely destination for the 41-year-old, who is keen to keep on playing. 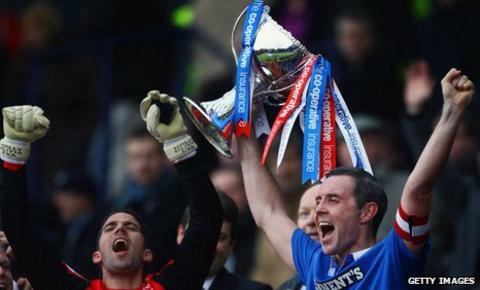 Since signing for Rangers in 2007, Weir has won three league titles, two Scottish Cups and three League Cups. "I've not got anything lined up in terms of where I will be going," the defender told the club website. "But, even now, I still want to play. "I wanted to give it a go for another year but it's not worked out." Scotland international Weir moved back north of the border after eight successful years at Everton, where he made over 230 appearances. Weir has already been linked with a return to former club Everton but BBC Sport understands this is not likely as he wishes to continue his playing career and he would not be offered that opportunity at Goodison Park. He was club captain under both Walter Smith and David Moyes before following Smith to Ibrox. "It will be an emotional week because it's the end of five years for me at Rangers, five years I have loved," added Weir. "I'm not sad about it. I'm just happy that I got the opportunity to play for such a great club. "During my time here I have got to play with fantastic players and work with great coaches and on top of that we achieved a lot." Weir was recalled to the Scotland squad at the age of 40 for the Euro 2012 qualifying matches against Lithuania and Liechtenstein in September 2010. He then became the oldest ever Scottish international when he played in the goalless draw in Kaunas. The last of his 69 caps came a month later when he played in a 3-2 home defeat to Spain. Weir, who began his career at Falkirk, has made just one appearance for Rangers so far this season, against Malmo in the Champions League qualifiers in July. Rangers manager Ally McCoist paid tribute to Weir on the club website. He said: "David has been a model professional ever since he signed for Rangers as a supposed stop-gap in 2007 and he leaves with our very best wishes. "Walter once said he rates him as one of his best ever signings and I would certainly go along with that because he has been terrific for Rangers and has shown great consistency. "If every player was like David Weir, management would be a much easier business and he is somebody we will really miss having in our dressing room. "He has been the epitome of a great Rangers skipper and it has an absolute pleasure to work with him over the last five years."